Watermelon will always be my go-to summer fruit. Chips and salsa is my biggest weakness. Throw them all together and I'm in for a dangerous, tasty summer treat! Check out the recipe below or click on over to the video to see this recipe in action. 1. Prepare the grill for direct cooking over medium heat (as close to 400°F as possible). 2. Sprinkle the brown sugar evenly on both sides of each slice of watermelon, and then grill over direct medium heat, with the lid closed, for 1 minute, turning once. Remove from the grill. Cut off and discard the rind, and dice the watermelon. 3. In a serving bowl combine the cucumber, mint, shallot, jalapeño, lime juice and zest, vinegar, crushed red pepper flakes, and salt. Fold in the watermelon. Cover and refrigerate for at least an hour to combine the flavors. 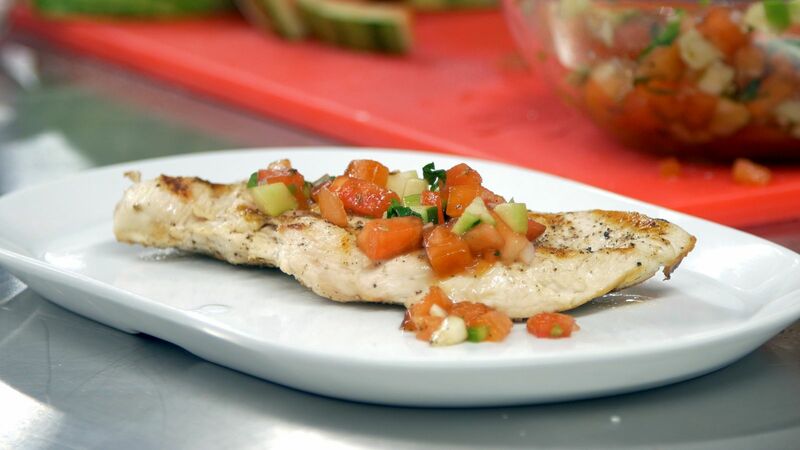 Serve the salsa with fish, chicken, or pork. ENJOY!